Jillax: Religious Pluralism in the Jewish State! Religious Pluralism in the Jewish State! One thing that is hard to grasp when you first land in Israel is not only the cultural diversity in the country (Jews are not only North American with origins in Eastern Europe, there are Jews from almost every country: Iran, South Africa, Ethiopia, Mexico, China, India), but the religious pluralism that exists. 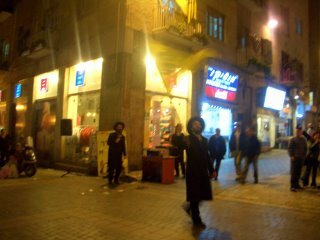 Seth and I went downtown to Ben Yehuda St. Saturday night since it is always packed (because most stores are closed during the day for Shabbat, the Jewish day of rest). Towards the top, an Asian group of young adults were singing beautiful Christian songs. 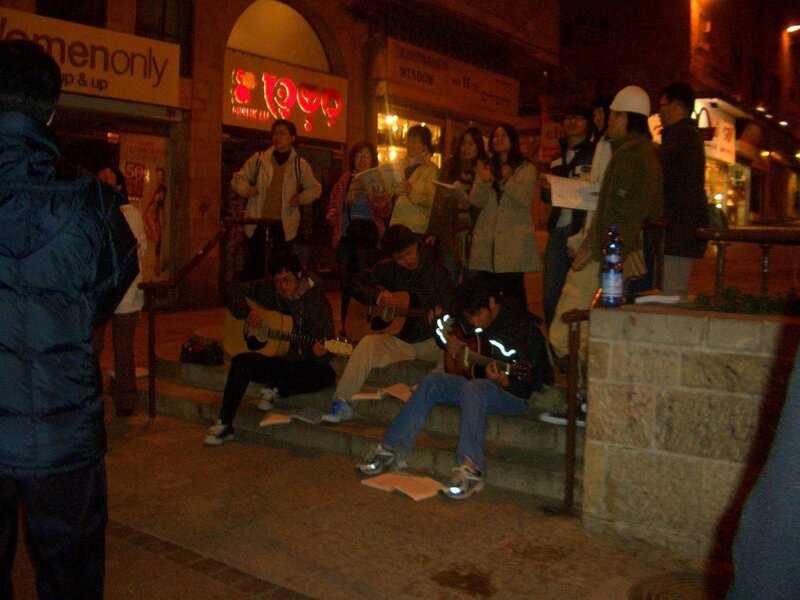 An audience had formed around them, and I was shocked to see that religious Jews were enjoying the music as well. About 100 meters down the street (a pedestrian mall), there were 3 Haredi (ultra orthodox) men: one was playing the keyboard, the other singing, and the third dancing with a HUGE yellow flag that had the words "Mashiach" (Saviour) printed on it. Every once in a while a few religious, and even non-religious young men would jump in and dance. It's nice to be reminded that in the holy city for Judaism, Christianity and Islam religion can be enjoyed together, and appreciated by all. Enjoyed the blog - cancun paradisus riviera. A new site has been launched with plenty of bargain holidays to choose from. Bookmark http://www.bargainplace.co.uk not just for bargain holidays but for flights and transport to and from airports plus travel insurance deals and holiday clothes. The buttons are free and could be hotlinked. Let's make some fun of Olmert! Please consider writing news pieces or an op-ed for Jewrusalem: Israeli Uncensored News. We strive to present different views and opinions while rejecting political correctness. Ideally, we try to make the news "smart and funny." Thus, your input is very welcome.